Cleanserp Virus is a website that might remind of a trustworthy search tool, but, in reality, it is a website that is spread by a browser hijacker infection. Because of this, users discover it set on their web browsers without permission. They see this new website set as a homepage and default search tool. That is, it is launched for them automatically each time their web browsers are opened. This web page might look like a genuine search provider, but it cannot be trusted by any means, so go to uninstall Cleanserp Virus from browsers the moment you have discovered it. Using this website to search the web might have undesirable outcomes, such as the entrance of dangerous malware, so letting it stay is really the worst thing you can do. If you still cannot decide whether you should go to implement the Cleanserp Virus removal or not, you should read the rest of this article. It will reveal more information about the website promoted by a browser hijacker. How does Cleanserp Virus work? Cleanserp Virus pretends to be a search tool, but it is just a medium for showing commercial advertisements to users. It will not display those ads as pop-ups or banners. Instead, what you will see is commercial advertisements in the form of sponsored links. They will be placed alongside normal search results. It is not very easy to say which of the search results can be trusted and which cannot, but there is a way to recognize them. If you have been redirected to a page which does not contain any information based on your search query, you, most probably, have clicked on one of those sponsored search results. It is a very bad idea to click on them because you might be redirected straight to bad pages which promote malicious software and might cause irreversible damage. Do not be one of those poor users who get infected with malware just because they use wrong tools to search the web – remove Cleanserp Virus today and start using a legitimate search engine. How did Cleanserp Virus enter my computer? There are several explanations why you see Cleanserp Virus on your browsers. First, you could have set it as your homepage and default search tool voluntarily. Second, it could have entered your system in a software bundle hidden behind third-party software. Finally, you could have downloaded it from the web without your knowledge. Browser hijackers might be spread using a bunch of different strategies, so you might find your browsers’ settings hijacked again if you do not do anything. How can I delete Cleanserp Virus from my web browsers? You will not be allowed to change your browsers’ settings unless you remove Cleanserp Virus from all browsers fully. There are two Cleanserp Virus removal methods you can choose from: you can either erase this website manually or automatically. The manual method is, of course, more suitable for those that have, at least, some experience in malware removal, so do not go to delete Cleanserp Virus manually if you know nothing about that. Instead, you should uninstall Cleanserp Virus automatically using an automated tool. 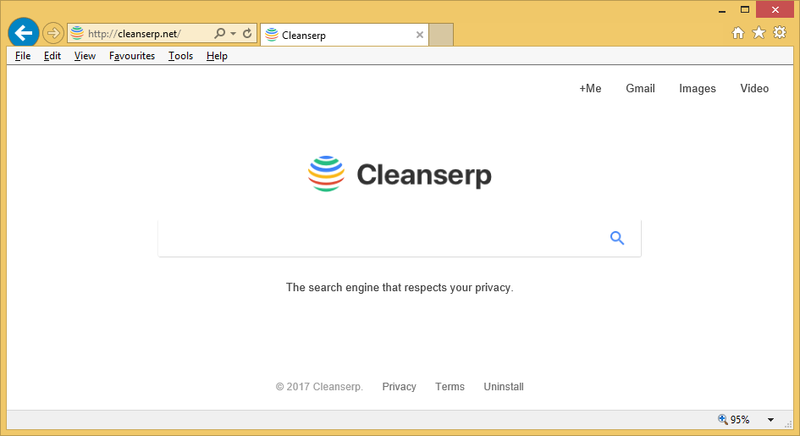 The most important thing, of course, is not the removal method adopted, but the final result – Cleanserp Virus must be removed from all browsers.